Salacgriva Port's cargo turnover in the first ten months of this year amounted to 298,400 tons, which is 32.9% more than in the first ten months of 2017, LETA learned at the port. The port transshipped 157,400 tons of pulpwood (97.8% increase y-o-y), 41,000 tons of peat (31.4% up), 34,500 tons of wood chips (42.7% decrease), and 35,900 tons of expanded clay aggregate (8.1% increase). The port also handled clay aggregate, asphalt, firewood, rocks, and logs. In January-October this year, Salacgriva Port served 103 ships, or 26 ships more than in the first ten months of 2017. In 2017, Salacgriva Port's cargo turnover was 263,600 tons - 9.5% less than in 2016. 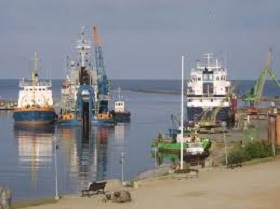 There are three large and seven small ports in Latvia. In 2017 Salacgriva was the third largest among the small ports by cargo turnover.